We have created supercool custom marketing solutions for every major brand in America. Who's next? Contact us to get started before your competition does. Custom Promotional Packaging. Custom Marketing Materials. Dimensional Marketing Collateral. Made In USA. Founded in 2014, Sneller Creative is the next phase of Jeff Snell's long entrepreneurial career. From 1999 to 2014, he helped start and run the most unique promotional marketing company in St. Louis, i Dream Solutions. Now, the amazing ideas, tireless work ethic and supercool creative solutions that have become synonymous with Jeff Snell are known simply as Sneller Creative. Prior to 1999 Jeff had many other sales and marketing adventures and has always been associated with success. But enough about Jeff. Check his social media pages, including LinkedIn, Twitter, Facebook, Instagram, Pinterest and more to fill in the gaps. Better yet, email or call ASAP. Every order and solution is custom and made-to-order, just the way you want it. Knowing a budget, quantity, desired delivery date, and any general idea of what the end result should accomplish helps speed up the conversation. But don't think too hard.. just contact him ASAP to get started. He never says no to a challenge, and rarely fails. Come on.. issue the challenge! I see the pretty pictures, but so what? How does this benefit me? Everyone has a story to tell, a product to sell, a message to get out to the world... we help them tell their stories with perfectly executed marketing materials. We put a logo on Anything! Connect and let's get started. Boxes, Binders & Tab Dividers, Folders, Printing, Promotional Products, Clothing/Wearables, Point-of-Purchase Materials, and so much more! Any material you can imagine.. from Paper, Wood, Plastic, Leather, Corrugated, Aluminum, Vinyl, Bookcloth, Canvas.. the list is endless as are the decoration options. Everyone who knows Jeff eventually buys from him. There is truly not a single family member, friend, neighbor or acquaintance that does not eventually need something printed by Jeff. So.. are YOU ready? Jeff Snell, The Sneller, JT Snell. Sneller Creative Promotions. Creative Master. 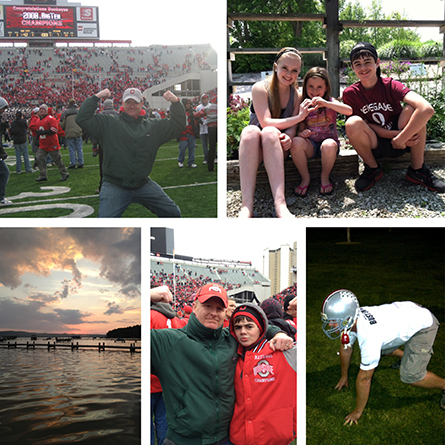 Ohio State Football Fanatic. Father of 3. Send Money! ​READY TO CREATE SOMETHING AMAZING? Custom Press Kits. Custom Product Launch Kits. Custom Marketing & Sales Kits. Custom Promotional Packaging. Custom Marketing Materials. Custom Dimensional Direct Mail. Custom Boxes. Custom Ring Binders & Tab Dividers. Custom Pocket Folders. Custom Printing. Custom Promotional Products. Custom Point-Of-Purchase Displays. Custom Clothing & Apparel. Custom Creative Marketing Collateral. Custom Prototypes. ​Custom Assembly, Fulfillment, Drop Shipping & Campaign Management Start to Finish. ​No Minimum Order!